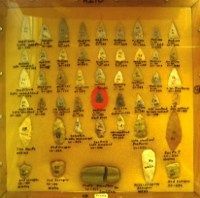 Spear points in the Al Reed collection. People have lived in the Prairie du Chien area for at least twelve thousand years. American Indians were the only residents for most of that time. Many different Indian cultures flourished here and left tangible legacies on the land. Some built mounds that still stand on the bluffs overlooking the Mississippi River. Some also left behind artifacts like the stone spear points in the Al Reed collection at the Fort Crawford Museum today. Meskwaki, Sauk, Ho-Chunk, and Dakota people lived at or near Prairie du Chien from the seventeenth century onward. The prospect of trading with American Indians here began to draw Europeans to Prairie du Chien in the late seventeenth century. Father Jacques Marquette and Louis Joliet were the first to record their arrival. They reached the Upper Mississippi River at Prairie du Chien on June 17, 1673. More French voyageurs followed, and by 1685, Nicolas Perrot built a fur trading post at Prairie du Chien called Fort St. Nicolas. French voyageurs and coureurs des bois continued to visit regularly to trade into the eighteenth century, but the British won control of the area in 1763, before the French had made a permanent settlement. French-speaking people began to reside permanently at Prairie du Chien in the 1770s. In 1781 the residents purchased the land from the Meskwaki people who had traditionally gathered on the prairie.